It’s easy to marvel at the athleticism and power behind a 90 mph fastball, but when Neil Roach watches a baseball game, he sees something else at work: evolution. That ability — to throw an object with great speed and accuracy — is a uniquely human adaptation, one that Roach believes was crucial in our evolutionary past. How, when, and why humans evolved the ability to throw so well is the subject of a study published today in the journal Nature. Roach, who received his Ph.D. from the Harvard Graduate School of Arts and Sciences in June, led the study, working with Madhusudhan Venkadesan of the National Centre for Biological Sciences at the Tata Institute of Fundamental Research, Michael Rainbow of the Spaulding National Running Center, and Daniel Lieberman, the Edwin M. Lerner II Professor of Biological Sciences at Harvard. The group found that changes to shoulders and arms allowed early humans to more efficiently hunt by throwing projectiles, helping our ancestors become part-time carnivores and paving the way for a host of later adaptations, including increases in brain size and migration out of Africa. What they found, Roach said, was a suite of physical changes — such as the lowering and widening of the shoulders, an expansion of the waist, and a twisting of the humerus — that make humans especially good at throwing. While some of those changes occurred earlier during human evolution, Lieberman said it wasn’t until the appearance of Homo erectus, about 2 million years ago, that they all appeared together. The same period is also marked by some of the earliest signs of effective hunting, suggesting that the ability to throw an object very fast and very accurately played a critical role in the human ability to rise to the top of the food chain. 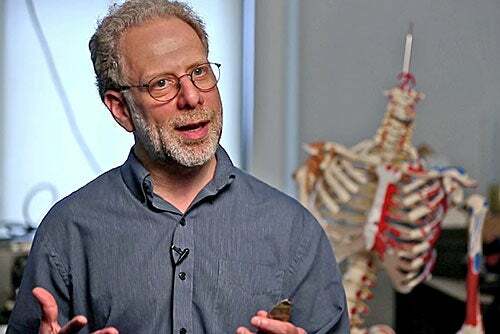 “The ability to throw was one of a handful of changes that enabled us to become carnivores, which then triggered a host of changes that occurred later in our evolution,” said Daniel Lieberman. To unpack the evolutionary origins of throwing, Roach began with the throwing motion of our closest relatives: chimpanzees. Though they’re known to throw objects underhand, chimps, on rare occasions, do throw overhand, but with much less accuracy and power than the average Little League pitcher, Roach said. Also, chimps throw as a part of display behavior, never when hunting. To explore those physical changes, Roach and colleagues began by creating a complex model that incorporated current research about the biomechanics of throwing. Using that model, they were able to explore how morphological changes to the body — wider shoulders, arms that are higher or lower on the body, the ability to twist the upper body independently of the hips and legs, and the anatomy of the humerus — affect throwing performance. Through a method known as inverse dynamics, Roach and colleagues were able to not only quantify how much restricting certain types of movements affected throwing performance, but were able to trace the effect to specific changes in the mechanics of each player. “We try to push these bits of anatomy back in time, if you will, to see how that affects performance,” Roach said. “The important thing about our experiments is that they went beyond just being able to measure how the restriction affects someone’s ability to throw fast and accurately; they allowed us to figure out the underlying physics. For example, when a thrower’s velocity dropped by 10 percent, we could trace that change back to where it occurred. When a pitcher’s arm is cocked, “what they’re doing is stretching the ligaments and tendons that run across their shoulder,” Roach said. “Those tendons and ligaments get loaded up like the elastic bands on a slingshot, and late in the throw they release that energy rapidly and forcefully to rotate the upper arm with extraordinary speed and force.” That rotation is the fastest motion the human body can produce. “The rotation of the humerus can reach up to 9,000 degrees per second, which generates an incredible amount of energy, causing you to rapidly extend your elbow, producing a very fast throw,” Roach said. Among the evolutionary changes that proved key to generating powerful throwing motions, he said, was a twist in the bone of the upper arm and an expanded, mobile waist, which gave early humans the ability to store up and then release more of this elastic energy. While the findings help shed light on a critical phase of human evolution, they also offer touch on a hotly debated issue in sports: When it comes to young players, how much throwing is too much? “It’s a tough question to answer,” Roach said. “The real difference, from an evolutionary perspective, is the frequency with which some folks throw now. To successfully learn to throw and use that ability to hunt, our ancestors would need to throw often, but nothing like the 100 or more high-speed throws that some baseball pitchers throw now in the span of a couple of hours. Ultimately, Lieberman said, the evidence points to one clear conclusion: The ability to throw with speed and accuracy is a uniquely human adaptation, one that played an immeasurably important role in human development. “Recent research indicates that stone points — the oldest kind of spear point — are about 500,000 years old,” he said. “But people have been killing animals for at least 2 million years, and eating animals for about 2.6 million years. Alán Aspuru-Guzik, a professor of chemistry and chemical biology, said organic solar cells are far cheaper and easier to produce and point toward a major possibility as a cheap power source for the more than 2 billion people worldwide without access to electricity.